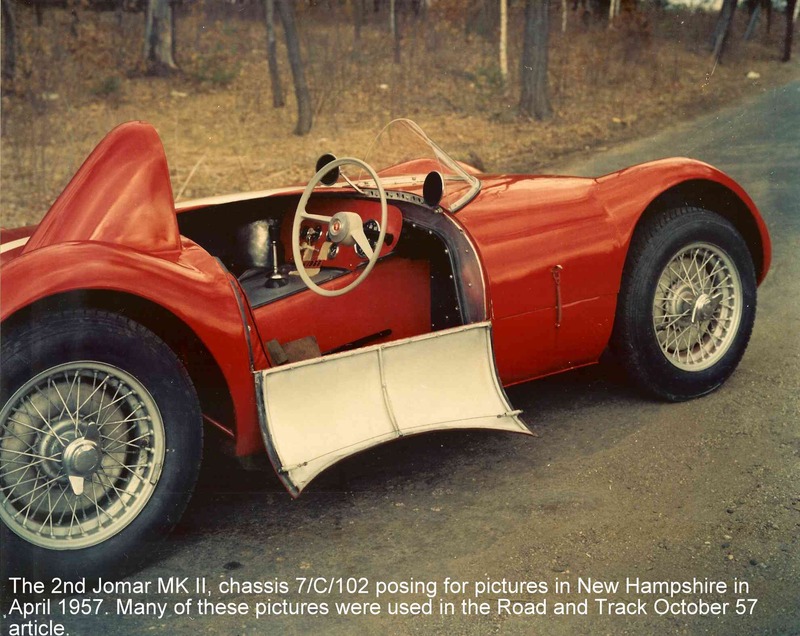 The Mk II Jomar is fast! On March 13th, (last Sunday) the SSR team took the first car, modified with all the new suspension updates to Thompson Raceway. At this time, Thompson was being expanded and therefore it was in rough shape. The car handled excellently. Only 20 laps were completed due to a gas line failure, but all present were impressed. 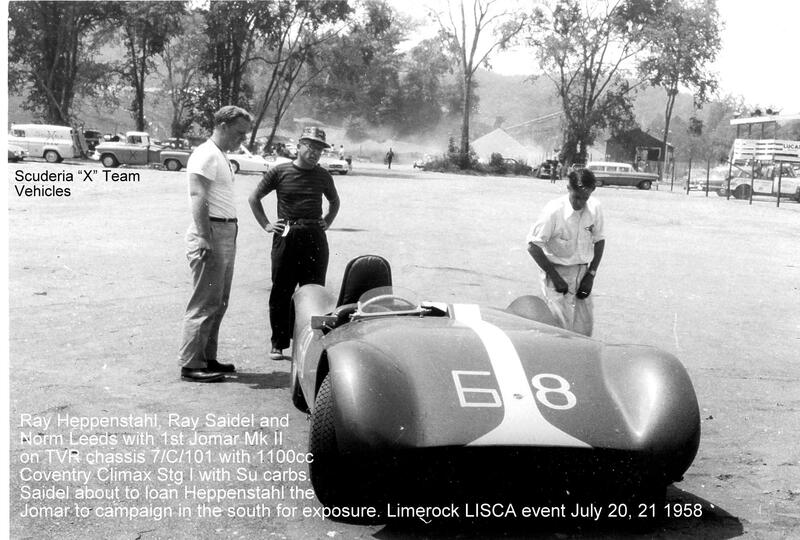 April 28 Opening of Lime Rock, Conn.
May 26 Opening of Thompson Conn.
Saidel had enlisted Mr. Gus Ehrman to drive a second car at Cumberland and hoped to convince Russ to bring his Jomar for a total of three. Repeat testing of the Jomar made the team eager for the end of April to come. 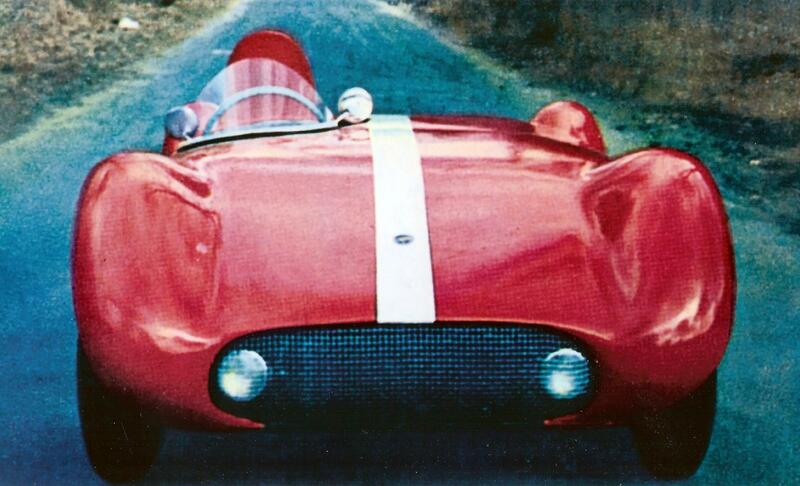 Columbosians car was finished in red with a white stripe bordered in red. The end of March saw TVR finishing the Blown Ford soupe. Bernard said it looked like a cross between a Porsche and a 300 SL, and the factory designated it The Gran Tourismo Coupe. 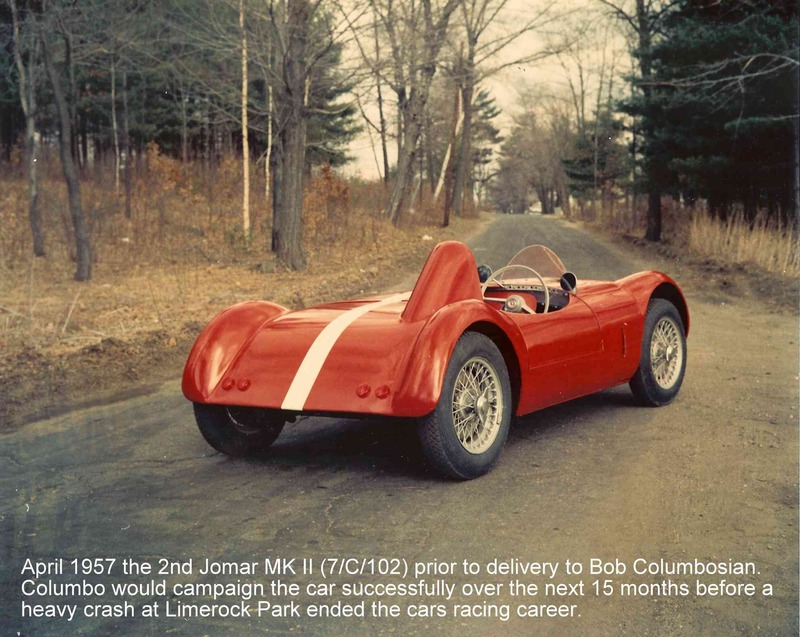 Four days before their first race Ray ordered a 5th chassis to be as #4, the Sebring Car that wasn’t, and wanted to get a price on Climax’s new `1500 cc engine. Finally the day came for Lime Rock, a 1.5 mile circuit full of twisting bends, fast and tricky. Some of the fastest Loti in the country were there. The course was the hardest he’d ever seen on suspension and handling, and the cars were superb on both points. 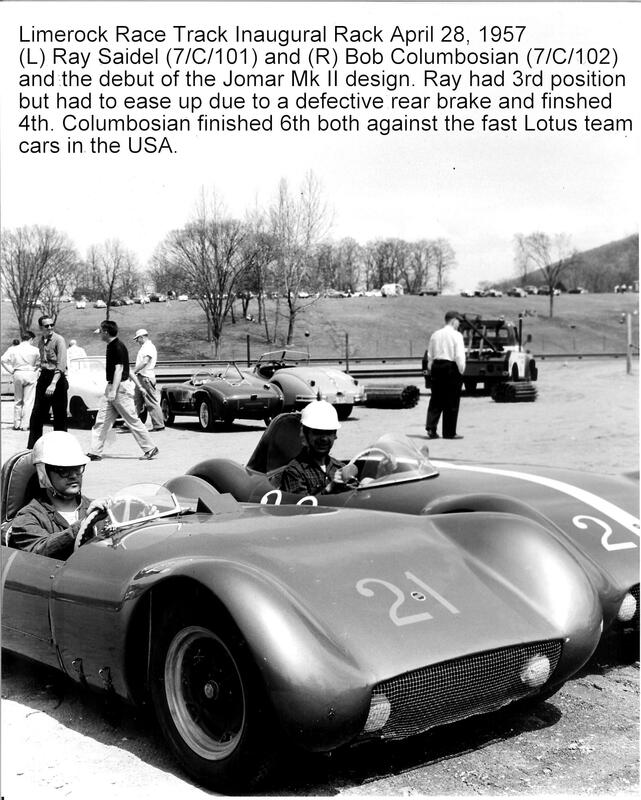 "Could have finished third, but due to a cracked and bent right rear backing plate, I had to ease off about half way through the race. I enjoyed the excellent thrill of overtaking all kinds of big machinery and holding off (in the corners) spider Porsche’s to say nothing about flying by Alfa Velocies like they were tied to a tree. 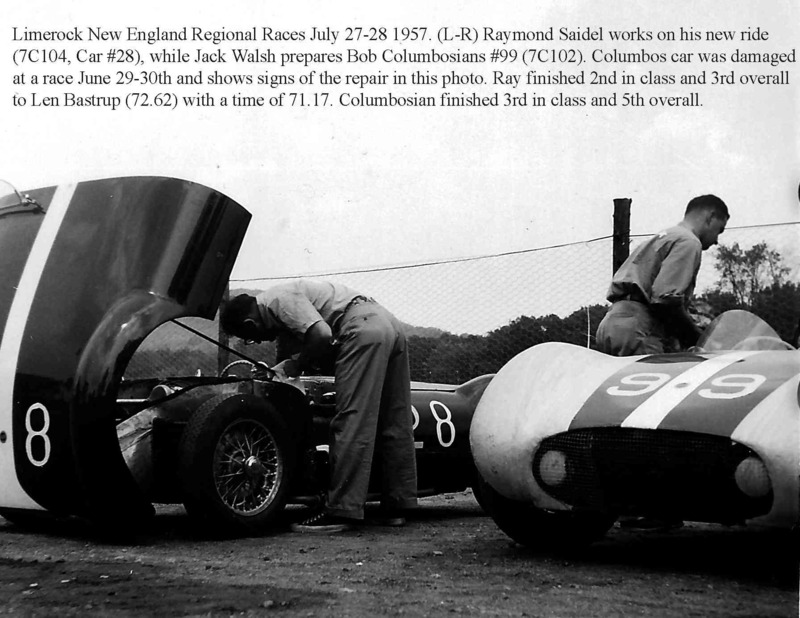 Note: Walt Hansgen, top driver for Briggs Cunningham (D Type Jag) came over after 6the race and mentioned how well he thought the cars handled and that they were going to be "real trouble" with a little more power." driver Mr. William Lloyd, who kept slowing me up on the corners. Saidel quickly moved to third overall position and was leading the class for five laps, while Rutan followed. The Webers were finally working fine and on the straights in fourth gear turned 7100 RPMs. Saidel didn't’ press the situation as his lead was comfortable. Suddenly Saidel began to smell gas heavily and then the engine quit completely. A broken fuel line T fitting had eliminated him from the race and prolonged the Jomars first victory. The Old #1 blue car came in 2nd driven by Charles Cunningham who had only one hour of practice in the Jomar on the day before. 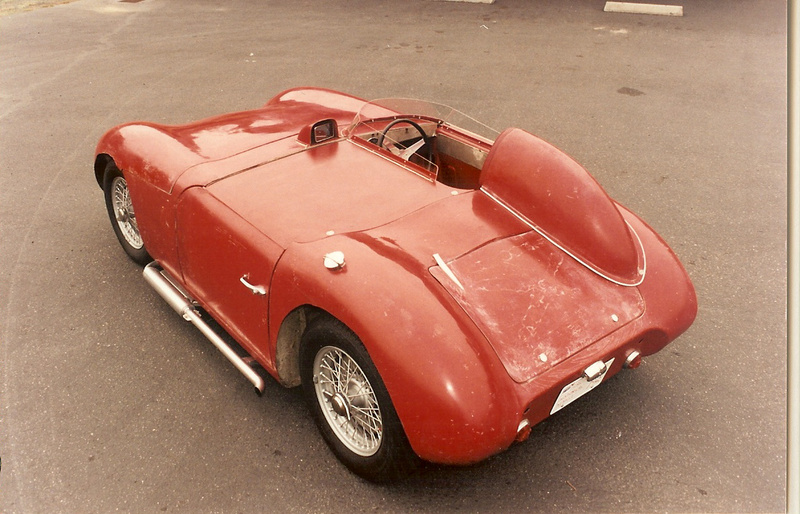 Ray has ordered a 5th racing chassis but to save time has asked TVR to build a fiberglass body for it. It arrives August 14, 1957.